On our 150th Anniversary, We Remember Stephen C. Martinelli - S. Martinelli & Co.
Now in our 150th year, we at Martinelli’s remember one of the biggest contributors to our company’s success and longevity. Stephen C. Martinelli was the third generation leader of Martinelli’s, and his impact on the family business and community of Watsonville will forever be remembered as one of his greatest achievements. Stephen was born in 1930, three years before Prohibition ended and the company brought back its award-winning, original hard cider recipe. He grew up watching his dedicated and hardworking father carry the company through the trying times of the Great Depression and WWII. After graduating from UC Berkeley and serving in the Navy as an Air Intelligence Officer, Stephen joined the company in 1955. The 1950s were a particularly rough era for Martinelli’s. After his father bought his siblings out of the business, there was little capital left to invest in the company. The sparkling cider business was barely surviving. Despite uncertainty in the company’s future, Stephen joined and worked with his father to keep it afloat. Stephen knew he had a legacy to uphold. 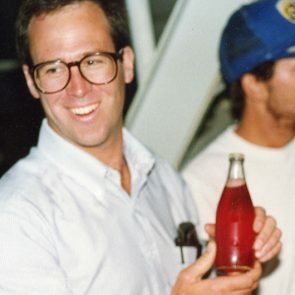 With his appreciation for Martinelli’s tradition, or what he called its “basic business model,” the company thrived under his leadership for the next five exciting decades. It began when Stephen invested in rebuilding the East Beach plant in the 1960s, spurring a growth trend that continues to this day. 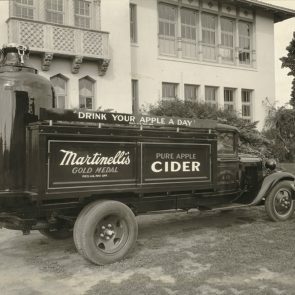 When his son John Martinelli joined the company, they both oversaw the modernization of the production equipment, which helped facilitate production for the growing international demand of sparkling cider and juice. Though more battles were ahead for Stephen, his leadership helped the struggling family business grow and prosper. Stephen is also recognized for helping build a relationship between the company and local apple growers. This was especially important when berries became a more popular crop in Watsonville and threatened the local demand for apples. 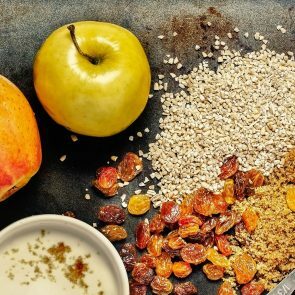 The reason apples continue to grow in Watsonville can be attributed to Stephen’s acknowledgement of the value of local apple growers and how their crops were key to upholding Martinelli’s gold standard. Stephen was also a gifted artist and helped design some of the company’s labels throughout the years. John Martinelli’s personal favorite of his father’s designs is one called, “The Old Timer.” In the 1960s, Stephen created a label for the company’s hard cider, paying homage to the company’s Gold Rush roots and the original recipe created by the company’s founder. This product was discontinued in the 1970s, but it still holds a special place in Martinelli’s history. With such notable accomplishments and an incredible work ethic, Stephen left a storied legacy to pass onto future generations of his family and the company. As we reach this next big milestone of our 150th anniversary, we remember him fondly and thank him for helping us making it this far. Cheers to the next 150 years, and from all of us at Martinelli’s, we wish you a prosperous 2018! I had my first Martinelli’s apple juice went I came to Ann Arbor to attend the University of Michigan. As I was walking and opened the cute bottle shaped like an apple. I stopped in my tracks and thought…”This will be the only apple juice I drink from here on! !” And my secondly, “I gotta go back NOW and get me another one of these juices!! !” That was over 32 years ago and Martinelli’s is the ONLY apple juice I drink!!! I turn up my nose to others!!! Love your products!!!! I have fond memories of Martinelli’s. Was only there for about 18 months. Very grateful for the opportunity to have worked with one of Watsonville’s most recognized brands and family owned businesses. Thanks to Martinelli’s I learned a bit of Customer Service, QA, and Human Resources. Family was always down to earth, sending me holiday greeting cards that I still have in my album to this day, and the employees were always pleasant to work with. Miss my days being able to drink apple juice or attending company events. Thanks to Martinelli’s, I was able to build my career in employee development and now I am the head of the HR department with another pioneering family business. Thank you for the opportunity! Martinelli’s always made me proud to live in Watsonville! So glad I can still buy the yummy juice. Thanks!!! Thank you for your kind message, we love to hear from our loyal customers! Because it is not currently in production, we are only selling the blood orange product in our company store. Please check our site regularly to see new products available in your area with our Store Locator. Hello! Last November, my husband and I visited your company store on the way to Santa Cruz from Portland, OR. I saw the sign from the car and made him turn around. We are huge Martinelli’s apple and sparkling juice fans!!! The gal working there was very pleasant and let us taste test all the different Sparkling Juices. We tasted the Sparkling Blood Orange and our taste buds fell in love! We were very disappointed that you are no longer producing it, as we know people in Portland would LOVE it! We do understand, the “name” is associated with apples. We bought a case and other items before we left, knowing we will stop buy again next year. Leave a reply for Lori J.